It goes without saying that this book isn’t for everyone (outside of the Bible, what book is? ), but it’s especially true that Brené Brown’s latest is not intended for anyone who fits comfortably in either faction of the ongoing culture war that continues to rage throughout the ironically titled United States of America. 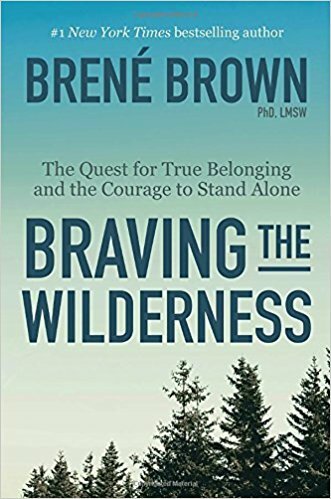 The central thesis of Braving the Wilderness, poignantly illustrated by the author through her own personal stories and a series of curated thoughts from notable guests, is that belonging is something that cannot be found among others but must be cultivated from within. Before being a TED speaker, Oprah’s featured guest, or any other similar buzzworthy designation, Brené Brown is a social scientist. Her expertise is in receiving, processing, and honing the experiences of those who have undergone harrowing journeys of pain and travail and who have lived to tell their story. The data from these interactions are what drives her books and gives them credibility. This courageous defiance is the emotional backbone of the book, and it’s what I resonated with most. As an African American man who’s spent most of his professional life in evangelical organizations, I know what it’s like to navigate the choppy waters of ministry and relationships across various cultures. I know what it’s like to try to be a cultural bridge, only to end up feeling walked on. I’ve had to learn how to make a home in the unpleasant rough that stems from repeated cultural alienation. I’ve been the token conservative in one room and the token liberal in another. I’m too black to be comfortable in Portland, and too Portland to be comfortable anywhere else. Third-culture people, multicultural people—these folks are my tribe. And these souls, people whose compassion, conviction, and courage are needed to help lead America out of the soul-sucking partisan abyss that threatens it, are to and for whom Braving the Wilderness was written. The meat of the book is a series of postures, practices, and attitudes that help us learn how to develop such resolve (“People are hard to hate close up,” “Hold hands with strangers,” “Speak truth to bull—”), but they also affirm and reclaim the value of our individual and collective humanity. Each of us, created in imago Dei, is on some level fundamentally good. Braving the Wilderness, then, is about taking on the journey of rediscovering that fundamental goodness, and holding it tightly during critical moments when others cannot recognize its value. In 2018, that’s a journey worth taking. Excellent review. This book is outstanding, and a great example of “all truth is God’s truth. The practical applications in the book are useful in church and secular contexts. Amen. Thanks for this excellent review, Jelani. Your good word about it puts it right on my list.